Love her or not, Serena Williams earns the attention she commands. 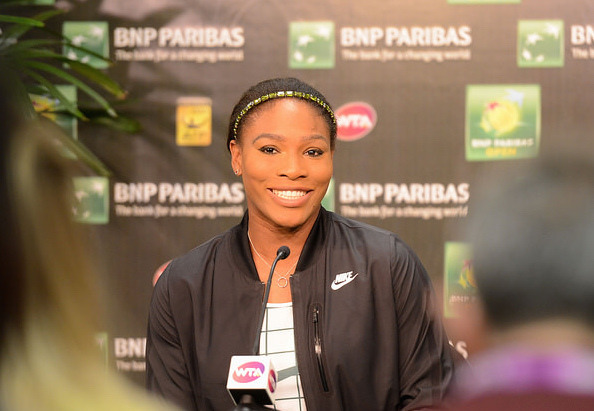 Nowhere was that more evident than during Thursday’s pre-match press conference at the BNP Paribas Open, her first face-to-face with a packed media room since that awful day in 2001, when she won the title and vowed never to return. It was just too hurtful, Williams declared. No one will ever know what she felt in her heart, how her emotions were kept in check when crowds booed and hurled nasty comments at her. The barrage extended through the entire match. However many times she out served or out maneuvered her opponent, a young Kim Clijsters, the fracas continued. The 2001 title was her second here; she also won in 1999, defeating Steffi Graf. Williams’ resume since has expanded in every form of dimension. She is the number one player in the world, and the oldest number player ever to sit at the top of the charts. Her decision to return, to face whatever lay in front of her, was a group effort, she said. She spoke with her family, spent time with her father and relied as always, on the guidance of big-sister Venus. Forgiveness, in part, motivated Williams to reverse the tide of her boycott. “In order to forgive you have to be able to really let go of everything,” she began. “I kind of did that a long time ago. But I still wasn’t at a point where I was ready to come back to Indian Wells. I was a little nervous. Trying to get over those nerves of coming back, and how will I feel, and what’s it’s going to be like. I have to experience that. The top seed barely moved a muscle during the 20-minute press conference. Her hair was neatly pulled back and tied snugly at the nape of her neck. She wore a Nike shirt and jacket; the Puma she donned during her two title runs, a distant memory. A simple combination of black and white, nothing as bright as her neon yellow dress she wore at the Australian Open. The only bling was a sparkly emerald green headband. It stood out in an otherwise subdued show of fashion. In addition to forgiveness and her sister’s blessing, Williams relied on family for strength as she waded through the years and experiences each spring brought. Finally, she approached her parents, Oracene Price and Richard Williams. This was long before conversations with Larry Ellison – co-founder of Oracle and biggest stake holder in the the BNP Paribas Open – Tournament Director Steve Simon, and CEO Henry Moore, all on hand today. This was long before she approached Time Magazine. Her father was also supportive. Nobel Peace Prize winner and President of South Africa from 1994-1999, Nelson Mandela, further steered her toward acceptance; she had read his much-acclaimed book, Long Walk to Freedom: The Autobiography of Nelson Mandela. Early in March, Serena joined forced with EJI — Equal Justice Initiative — using her return to Indian Wells, “as an opportunity to support EJI’s work confronting racial inequality and justice,” a statement which appears on its web site. The BNP Paribas Open is certainly better with Serena Williams in the draw. Since her departure, she’s accumulated 63 career titles (65 overall), and over $66 million in tournament prize money. She has a grand total of 19 Grand Slam singles and 13 Grand Slam doubles crowns, plus a Gold Medal in singles from the London Olympics, and three Gold Medals in doubles. Serena “honestly” doesn’t remember what the Indian Wells Tennis Garden looked like in 2001. Maybe her lapse in memory can be attributed to post traumatic stress, but no medical conclusion has ever been revealed. No one needs that type of confirmation, either. The years away speak clearly. Sounds about right. And, she’s done just that since.